I'm happy for the novelist Jonathan Safran Foer. His new book Eating Animals is getting lots of respectful attention (like here and here), and that's good both for him and for animals. I'm happy for him. Really! OK, I'm insanely jealous. Here's why. What he's got going for him is narrative. He tells the story of the animal issue, instead of systematically working through it. Judging from the essay he had in the New York Times Magazine a few weeks ago, his book is all about growing up in a Jewish "pass the brisket" household. It's about his grandmother, and traditions, and having children, and close encounters with animals. Narrative makes things readable. It's lovely the way a story unfolds, keeping you in its grip to the end. Arguments, on the other hand, can come across like an assault. As soon as someone starts arguing (especially in the explicit fashion that philosophers love so dearly), you start feeling bad. First, you start wondering if you're going to be too stupid to understand. Then, once the argument gets going, you start feeling pinned. Either you're going to have to make an effort to extricate yourself, or you're going to have to undergo a change of mind--and who really wants that? It's so much more pleasant just to read a story, which (you know) may subtly alter your perceptions, but without being so...frontal, and violent, and obvious. My new animal book starts with narrative and there's as much narrative as I could muster throughout the book. But the fact is the book has lots of arguments. I like arguments. I'm interested in arguments! And so--ironically, sadly, understandably, probably--my book will never reach the sort of audience that Safran's can. It couldn't, even if I had as much talent as an arguer as Safran has as a story-teller. Stories just win in a competition with arguments. I get that. I understand that. I like stories too. But...it's...frustrating! Arguments don't make for backbone. While images are more powerful than stories and stories more powerful than arguments, arguments and reasons allow one to analyze a situation and to change it. I would also wager that a mindset changed by arguments and reasons is more lasting than one changed by a story or by an image. Personally I don't find stories more powerful than arguments--at least not necessarily. Singer's Animal Liberation changed my mind about whether or not it's OK to eat animals more than stories I'd read about the subject. On the other hand, my views on abortion, such as they are, were significantly altered by real life experiences (which I class as stories). But I then feel it necessary to run those experiences through arguments: I'm not satisfied with a "merely" emotional response. It needs to be grounded in something that can be articulated or I don't view it as something that I can commit to. To the degree I can't articulate it...I view things as unsettled. I'm not sure that arguments are inherently more "frontal, violent, and obvious." Indeed stories can be considerably more violent, more vivid, and more direct. 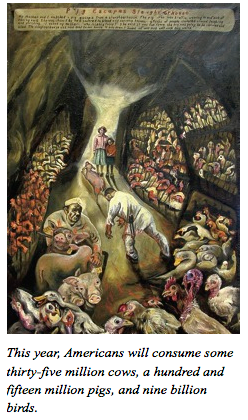 Once could make the case for animal rights with a cornucopia of violent imagery from slaughterhouses and labs. Coupled with pictures, people do. But should public policy be based on such stories and such imagery? But yes pragmatically stories may be more influential, and certainly more popular, than arguments for most people most of the time. One more argument for religion?